All speakers have resistance to electrical current. Resistance to Alternating Current (AC) is called impedance. Impedance cannot be easily measured, it is usually calculated. This is because there are three components found here: direct current resistance, capacitive reactance, and inductive reactance. 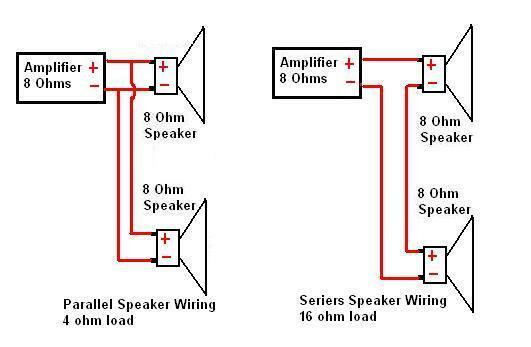 Speakers usually have two components which make up the impedance: voice coil resistance, and voice coil inductance. Thus, the resistance of the voice coil is the direct current resistance, which can be measured with an Ohm meter. The inductance of the coil can be measured with special tools or calculated. This factor (inductance) accounts for the inductive reactance. These two components together form to make the impedance of the woofer. Typically the impedance of most speakers is between 4 and 8 ohms. However, the impedance of the speaker is not the same at all frequencies. Usually, the resonant frequency of the speaker yields the highest impedance. 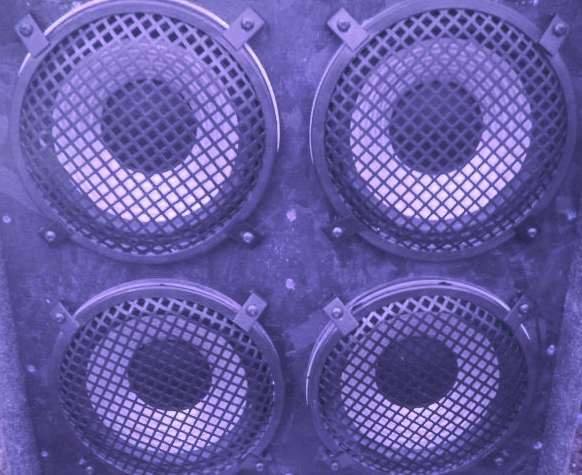 When multiple speakers are connected to an amplifier, certain decisions need to be made. How will the speakers be wired to amplifier? Will this wiring present a proper impedance to amplifier? Will this wiring reduce the fidelity of the speaker system? 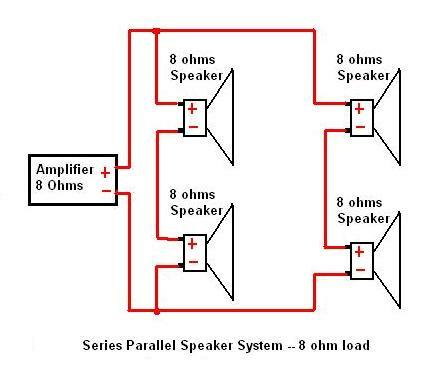 If you have an amplifier with an 8 ohm output jack, and you have one speaker that is rated at 8 ohm impedance, you simply connect the two devices together. But if you have two speakers, you now have a decision to make. Should I wire these in parallel or series? What will the resulting impedance be? What if the speakers are wired out of phase? These are the questions that need to be answered. First, most transistor amplifiers can tolerate a range of impedance loads. Typical is 8 or 4 ohm loads. Some amplifiers are rated for 8, 4, 2 ohm loads. However, tube amps are very particular about loading issues. If the amplifier says 4 ohms, then you better have a 4 ohm load. Transistor amplifiers operate on completely different basis than tube systems. A tube amplifier is really an current source device, this is why it requires a load to operate. A transistor amplifier is really a voltage source device, and does not require a load. No load is view by it as infinite resistance. For tube a amp, no load (no speaker) is a disaster, and appears as a short to the system. If you wire two 8 ohm speakers in parallel, the resulting impedance is 4 ohms. If you wire two 8 ohm speakers in series, the resulting impedance is 16 ohms. The 4 ohm load will draw more power, because the impedance is lower, but the amplifier will not have as good of control over the speaker as an 8 or 16 ohm load. The series load of 16 will provide the best control for the amplifier, but the power will be reduced, and the high frequencies will also be reduced. This is because the voice coil for each speaker is acting as a low pass filter to the other speaker. If you have 4 speakers, they are typically wired together in series-parallel. See the above wiring diagram. This is where two of the speakers are wired in series with each other. The other two speakers are wired in series too. Then the resulting systems are wired in parallel. If all four speakers are 8 ohms, then the result from this wiring practice is 8 ohms.